In lively verse and detailed pictures, Linda Ashman and S.D. Schindler explore the lives of many different people in the castle. The earl, head of the household, has everything at his command, but he's bored. The solution? He orders a tournament to be planned and we hear from members of the castle community as they plan this event. The herald, the steward, the cook, the suitor, and many more tell their tales as they make ready for the event. The book introduces each person with a poem and then provides additional information about them at the end of the book. This is a great introduction to the people who might live in a medieval castle. The verses are fun and interesting and they beg to be read aloud. Each person has a distinctive voice, which switches things up a bit. Robbers hover in the forest. Steady rain turns roads to rivers. Constant riding hurts my back. While the lesser knights and nobles find an inn to rest their heads. Stuck with ten pathetic travelers, twenty rats, and countless fleas. The illustrations have a lot of intricate detail and many of the initial letters are drawn large and decorated like in medieval scripts. Kids will love little details, like the eyeballs and spare parts that are ground up into mystery meat and the vertical picture that shows the job of the gong farmer (his job was to clean out the privy...). Each player gets a short, informative blurb at the back of the text that explains a little more about what they did in the castle or defines unfamiliar words used in the poem. All in all, this is a great introduction to the medieval castle. 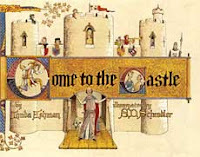 The poems are sure to pique kids' interest and add to any unit on the Middle Ages. Come to the Castle is on shelves April 14. It's Nonfiction Monday and Tina's got the roundup at Tales from the Rushmore Kid. Hey! first time here. Nice to land on a fellow booklovers blog! I'm inviting you to this new Book Reviews blog. You should consider joining our blog as a reviewer. Book Reviews is a forum for all of us who believe that books can change us for the better. You can write about any book that you enjoyed reading and motivate people around you to read it. By this, we can help spread the joyous habit of reading, in our own little way. You can repost all your book reviews at Book Reviews, both old and new!